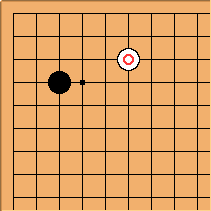 It is possible for Black to ignore here. This position may also occur as a 6-3 point joseki. 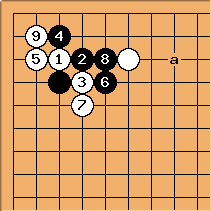 In practice this sequence appears, in pro games, which is the same as if there were a black pincer stone at a (3-4 point distant low approach) and the usual variation. At this point some deviation should occur. These are pro plays: to control , to kill off is then thick. See also 3-6 point pincers for some ideas that are rarer, in pro games anyway. 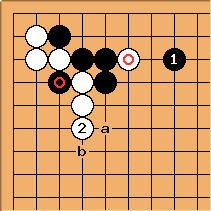 This variation first appeared in Zhang Xuan (Black) vs Yokota Shigeaki (White) on 1990-04-19. 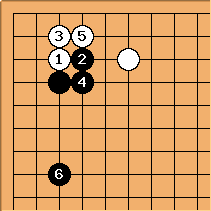 In this Japan China Super Go game, Zhang Xuan won by resignition. It is also possible to hane at . The resultant position is somewhat low for Black. The hanging connection of is good for eye shape. may also be played lightly at a or b, with a possibility for entering the corner at c later. It is not advisable for to enter the corner at c without additional support. 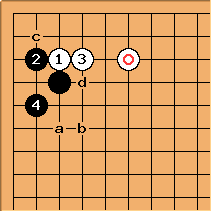 may also play higher at d, which may lead to a gote variation or a fighting variation.